HISTORIC HAMILTON & HISTORY SCOTLAND MAGAZINE. Today we are putting the history of Hamilton back on the forefront of Scottish history. One of our stories about the Hamilton Tolbooth has been published on the History Scotland magazines website. This paves the way for Historic Hamilton and the History Scotland magazine working together in the future and keeping our towns history alive. In turn, I hope that this new joint venture shows more people out with Hamilton, how much of a rich history we have. Posted on August 16, 2018 Categories Hamilto, Historic Hamilton, UncategorizedTags History Scotland, social media, TolboothLeave a comment on HISTORIC HAMILTON & HISTORY SCOTLAND MAGAZINE. Neil Connery comes to Town 1979. In 1979 Actor Neil Connery, brother of Sean visited Hamilton to open the fete at the Hamilton South Church. Gathered were a group of young boys who were keen to see Neil’s skills with the Wee Arras. Are you one of the boys in the picture? Or do you know who they are? Let us know! Picture courtesy of Paul Veverka. Posted on July 14, 2018 Categories Garry L McCallum, Hamilto, Historic Hamilton, UncategorizedTags 1979, Hamilton South Church, Neil Connery, Sean ConneryLeave a comment on Neil Connery comes to Town 1979. UDSTON HOUSE. – Researched & written by Garry McCallum. Many of Hamilton’s old mansions and country houses have long been demolished, whether through falling in to disrepair or by subsidence through the collapse of an old coal mine deep beneath its foundations, however, Udston house has stood the test of time and is still to this day standing proudly on a high vantage point that would once have commanded views over the vast countryside of Lanarkshire. There has been a house standing on the site of Udston since 1593 which belonged to John Hamilton of Udston, an ancestor of Lord Belhaven and Stenton whose wife purchased the present house in 1893. I will tell you about Lady and Belhaven later in the story. Udston House is a country mansion and it was built between 1851 & 1855 by Lewis Potter. It was a fine mansion having ornamental grounds with a large garden. It had offices with a glasshouse adjoining it. Udston House is built upon the site of Mains of Udston, a name now extinct and long forgotten. The house had 3 public rooms, 11 Bedrooms, 2 dressing rooms, Pantries, Store Rooms, a boot room and it boasted of having ample servant’s accommodation. It had a conservatory, a walled garden, vineries and stables. It also had its very own coach house and a Byre, and the extensive gardens surrounded its grounds. Before I tell you about Udston House, it is important that I tell you a bit about the man who built it. Lewis Potter was a very rich and powerful man. He was born at Falkirk on 29 May 1807 and he was the son of James Potter and Janet Wilson. He had a keen mind for business and became very prosperous as a shipper. He then speculated in Australian land, and through this, he became a very wealthy man. He was invited to join the board of the City of Glasgow Bank in 1859, where he quickly progressed and became a director, and he borrowed large sums for his land speculation. His job as a director in the bank nearly ruined Lewis Potter when the 1878 recession affected many people across Brittan, the City of Glasgow Bank collapsed with debts of over £5 million and the directors were taken to court and found guilty. Lewis Potter received an 18-month prison sentence for the part in which he played that instigated the bank’s collapse. When Lewis’ prison sentence ended, he returned home and continued to live at Udston House until he sold the country mansion between 1879 & 1881. This picture shows Lewis Potter and his family seated at the front of Udston House and it was taken in the year 1877, this could have been the last picture before the family moved from the family home at Udston. In the picture, L-R is: Susan Colville Potter, Lewis Potter, Louisa Catherine Black, Christina Gladstone Richardson, Margaret Muirhead Potter, John Alexander Potter, Emma Muirhead Potter, Margaret ‘May’ Potter Muirhead & James Muirhead Potter. I have to say that Lewis looks deep in thought in this picture, and when it was taken in 1877, Lewis would have been looking straight in the direction of Glenlee House. This view in his day was quiet countryside, unlike the view today, where you would be staring at the Udston Woods, St. John Ogilvie High School and the new houses that were built on the edge of the Udston woods. So, back to Udston House! After the House was built, the very first recorded birth at Udston House was the daughter of Lewis Potter who was born on the 2nd of November 1856 and her name was Emma Muirhead Potter. This was Emma’s family home until she moved to Edinburgh with her father when she was in her early 20s. On the 28th March 1861, a marriage takes place at the house where Lewis’ second oldest daughter Jean Ronald Potter marries a man named William Orr and this man, like her father, was also a Glasgow Merchant. Udston House had beautiful gardens and in 1861. It was surrounded by the quiet countryside so this would have been the perfect place for a marriage to take place. Lewis Potter had other land interests in the local area and not only owned Udston House, he also owned Greenfield Farm, Udston Farm, Udston & Dykehead Farms, land at Birdsfield and the farmland in which he owned was leased out various people for the extraction of coal. As Lewis moved away from Udston House and Hamilton, he just missed out on the opportunity to exploit this extraction of the rich coal seems beneath his lands. It is unknown why he did not become a coal master; Perhaps Lewis was aware that there was black gold under his lands and maybe he never acted on starting a mining firm due to his losses in Australia and he knew more than any man about the risk involved. After all, he was more of a ‘landlord’ than a coal master. Janet Stark (50) – Domestic Servant – Born: Cambusnethan. Agnes Brown (26) – Domestic Servant- Born: Mauchline. Mary Shaw (28) – Domestic Servant – Born: Kinross. Margaret Mitchell (24) Domestic Servant – Born: Moorgreen, Fife. Margaret Patrick (24) Domestic Servant – Born: Eaglesham. Alexander McMillan (28) Butler – Born: Dumbarton. Ann Anderson (50) Companion (Lady in Waiting) Born: Glasgow. The lady called Ann Anderson who was listed as a companion would have probably been Margaret Potter’s lady in waiting. James Baird (35) – Joiner – Udston Offices. Neil McTaggart (40) – Coachman – Udston Offices. Alexander Jarvis (27) – Gardiner – Udston Offices. Margaret Parker (60) – Gatekeeper – Udston Lodge. James Watson (28) – Gardiner – Udston Offices. There are no local people employed at Udston House, Lewis Potter recruited people from Ayrshire, Dumbartonshire and Glasgow and surrounding areas of Hamilton. It is unknown if he was being prejudiced towards the people of Hamilton or not. On the 7th of November 1863, Lewis puts out an advert in the Glasgow Herald and he is looking for a tenant to live and work at Greenfield Farm. Greenfield farm was still more of a working farm deep in the country and within the next Twenty years the coal which was buried beneath its grassy fields would transform this little place out in the country to an industrial small town which would see hundreds and thousands of people flocking to Burnbank and Hamilton looking for work. A second marriage takes place on the 30th of March 1865 when Lewis’ other daughter Eliza Anne marries another Glasgow Merchant that went by the name of William Couper. The Potter family’s lives were about to be torn apart! On the 2nd of August 1865 Lewis’ Oldest daughter Janet Wilson died of a fever at 64 Westbourne Terrace in London. The Hamilton Advertiser reported Janet’s death and it was printed on the 5th of August 1865 the following article was written. On the 12th of August 1865, the Hamilton Advertiser covered the funeral of Janet and the below article was written. The funeral of this esteemed lady took place on Saturday and was attended by a select circle of mourners. At half past two o’clock the party assembled at Udston House where the devotional exercises had been conducted in a very impressive manner by the Rev Mr Buchanan, the mournful procession was formed. It was preceded by a hearse and four and consisted of five mourning coaches and three private carriages, containing the bereaved relatives and friends of the deceased. There were happier times ahead at Udston House, Lewis’ daughter Louisiana Catherine was to marry her sweetheart, Rev Robert Black, who was the minister of the United Presbyterian Church at Chapel Street in Hamilton. I must note that the Funeral of Janet Potter and all the marriages that had taken place at Udston House were performed by the Rev William Buchanan, Rev Buchanan was not only the family’s minister but a friend of the Potter family. Louisiana Potter was a very religious person, she was educated at Miss Law’s School in 1862 in Hamilton where she won a prize for Examination on the Epistle to the Galatians, plus a Special prize for Biblical knowledge. On the 23rd October 1869, Lewis Potter puts an advert in the Hamilton Advertiser looking to rent an unfurnished mansion house for 1 year. He wanted a garden and Coach house and 10-50 acres of land. It is unclear if he is looking to rent, or if this was one of his own properties which he was renting out. Andrew Fraser (44) – Butler – Born in England. Janet Stark (65) – Domestic Maid – Born at Carluke. Euphemia Munro (28) – Servant – Born at Nairn. Elizabeth Gemmell (25) – Domestic Servant – Born at Neilston Ayr. Margaret Peri (32) – Domestic Servant – Born at Banff. Jane McColl (20) – Domestic Servant – Born at Bothwell. Udston Stables – James Dalglish (26) – Gardner. Udston Stables – John Turner (34) – Coach Man. Udston Stables – Thomas Baird (43) – Land?? Udston Lodge – Margaret Parker (38) – Dress Maker. Again, Lewis Potter is not employing anyone from Hamilton, this is not to say that the people who he has employed eventually moved to Hamilton prior to their employment. Now Lewis Potter didn’t seem to appear to be an old scrooge as In June 1872 through his own kindness and at his own expense, he put on an excursion for the Chapel Street Boys and Girls Church. This Church was close to him as the minister of this parish was his Son-In-Law, Robert Black. On this day he treated the kids to a day at Udston House and when they arrived they all lined up on the spacious lawn at the front of the house and the boys and girls received buns and oranges. They were treated to a full day of sports and games and it was a fun day out in the country that the kids really enjoyed. In September 1874 Udston House had a very special visitor. Sir Andrew Lusk, who in this year was the Mayor of London arrived in Scotland on business and with him, he had his wife. The Mayor’s wife was none other than Eliza Potter, Eliza being the daughter of Lewis and brother to Lewis Esq, Eliza had come to visit her father. They stayed at Udston House for a few nights before departing back to London. On Wednesday the 9th of April 1879 an advert appears in the Glasgow Herald, Udston House is up for let. Lewis Potter after spending around 28 years at the house has now moved out, perhaps living out in the middle of the country and having to travel is taking its toll on Lewis. He decides to move to Edinburgh and he buys himself a new and smaller house at 15 Warrender Park Road West. He lives at this new house for only two years, but his health deteriorates, and he is suffering from chronic bronchitis and dies on the 17th of June 1881, he was 74 years old. His daughter Emma is the person who registers his death. Scottish Peer buys Udston House. So, changes are ahead at Udston House and it is now under new ownership and it is purchased between 1879 and 1881 by the Right Honourable Madeline Louisa Keith-Falconer. Lady Madeline Louisa was the wife of Francis Alexander Keith-Falconer who was the 8th Earl of Kintore. The Earl had died in 1880 so the purchase of Udston house was done around the time of the Duke of Kintore’s death. At this time, I can’t confirm if Madeline Louisa lived at Udston House, there are no documents that I can find to confirm that she did. The house could have been bought as an asset to use as a source of income after her husband’s death, she did, however, lease the house to a farmer who was called Ann McCall. In 1881 Anne or Annie as she was known was living at Udston and on the census, return it was listed as ‘Udston Mansion House’ She was recorded on the census as an ‘Annuitant’ This indicated that she was living on her own means, so she was either receiving an early kind of pension or money from an investment or insurance policy of some sort. Mary Russell (16) – Table Maid. Eliza Sinclair (37) – House Maid. Jessie Laing (24) – Nurse. Barbra Crosby (14) – Kitchen Maid. Margaret Anderson (42) – Cook. The House was well equipped with staff to look after this family and in 1881 while Annie and her boys were living at Udston there was another family living here who went by the name of MacLaverty. This was Annie’s Daughter Ann, and her husband Ronald MacLaverty and they had their son Ronald Jr living here too. Ronald Snr was also a Commissions Merchant and the family had spent some time abroad as their son was born in Singapore. Annie McCall previously lived at Fairhill House where her husband was a Corn Factor, her husband Thomas died in 1874 and this presumably instigated her to move to Udston House. She lived here for only a short time after, where she moved on to Auchingramont House. Annie died at Auchingramont House on the 22nd of April 1899. Essie Fortune (70) – House Keeper. Janet Wetherspoon (27) – Cook. Sophia Cameron (25) – Table maid. Mary Little (22) – House Maid. As you can see by the end of 19th century the staff employed at Udston was becoming much smaller. The third person to take ownership of Udston was Colonel John Clarke Forrest, who had spent the shortest time at Udston as he had only lived at the house for under three years. Colonel Forrest in his day was a very respected man in Hamilton and in the 1880s, he was the Provost of Hamilton, Justice of Grace and Assistant Sheriff-Substitute of Lanarkshire and not to mention Captain of the 2d L R V Proviant Grand Master Middle Ward of Lanarkshire. Colonel Forrest lived in other large houses around Hamilton, but none such as grand as Udston. In the 1890s he was living at Auchinfoot on Auchingramont Road and he was working as a Banking agent, in the 1880s, he was living at Muir House on the very busy Cadzow Street. Cadzow Street in the 1880s was the main thoroughfare to Hamilton from Glasgow. Colonel John Jack Forrest is the first person who died at Udston House. He died on the 28th of August 1893. The house was put up for sale only three months after his death, but it was to be quickly snapped up by another Scottish Peer. Udston was now in the hands of the executors of John Clark Forrest! The fourth owner to acquire Udston House was from another Peerage of Scotland and upper-class family. Its new owner, who purchased the property between August & November 1893 was called Lady Georgina Belhaven and Stenton. This family were a descended branch of the prominent Hamilton family and direct descends from John Hamilton (d. c. 1550), the illegitimate son of James Hamilton, 1st Lord Hamilton and unlike Madeline Louisa Keith-Falconer, Lady Belhaven lived at Udston House for most of the summer months. She purchased Udston as a summer residence and there were alterations done to the villa in 1897 and later 1911 by Gavin Paterson, who was an architect from Hamilton. Lady Belhaven lived at Udston House for quite some time, her daughter Clarice married the son of Lord Napier at St. Mary’s Cathedral in Edinburgh in December 1899. This was a very prestigious wedding with many of the Scottish upper class in attendance. Now, why would Lady Belhaven move to Udston House? Well, she may have moved here to be closer to her family. Sir John Watson, 2nd Bard of Earnock was only living a couple of miles up the road at the large Neilsland House, John was related to Lady Belhaven as he was her brother and on the wedding of Clarice, he walked her down the Aisle at St. Mary’s Cathedral, it was a real family gathering of the Scottish hierarchy. At the turn of the 20th century, country houses across Lanarkshire were slowly switching from candlelight to Electricity and previously during the 63 years of Queen Victoria’s reign, from 1837 to 1901, life in ordinary houses were transformed by a succession of technological developments which we now take for granted: flushing toilets, plumbed-in baths and showers, regular postal deliveries and light fittings capable of illuminating whole rooms at a time. At the start of the Victorian period, most houses were lit by candles and oil lamps. Interior fittings included chandeliers (suspended from the ceiling) and sconces (fixed to the wall) however, these were mainly used on special occasions, and most ordinary events after sunset took place using portable light sources such as candlesticks, candelabra (bracketed candlesticks) and oil lamps, and by the light of the fire. By the end of the period, gas lighting was common in urban homes and electricity was being introduced in many larger houses such as Udston. On the 18th of November 1904, it was reported in the Hamilton Herald that Udston House was to have its very own electricity supply fitted. Even back then in 1904, Udston was still classed as the countryside and at night it would have been very dark, so the new electricity system would have been a very exciting time for the staff who worked here. Lady Belhaven eventually moved from Udston House around 1905. Now, this is the end of the trail for Lady Belhaven’s time at Udston House. Donald Chisholm (47) – Head Gardner – Udston House – Gardner’s Cottage. John Thornton (17) – Bothy above Stables at Udston House. George Simpson (61) – Caretaker. So, around 1905 Jackson Russell is the proud new owner of Udston and at the turn of the century, we see how wealth has changed from upper class-families to working class coal-masters. This is a time when Hamilton has now become a thriving mining town. The Russell family were a hardworking one, and their empire was part of Jackson’s father who was Archibald Russell of Auchinraith House in Blantyre. Mark Allan (45) – Gardner – Udston Lodge. James Letterick (34) – Gardner – Udston Stables. Alexander Young (21) – Gardner – Udston Stables. William Nicoll (24) – Chauffer – Udston Stables. Alexander McCaskie (45) – Gardner – Udston Stables. On Wednesday the 10th of July 1912 Jackson Russell puts out an advert for a table Maid at Udston House, even in this year servants still play a very important role in large houses. But It seems that he either can’t find someone to fill the role or the person that he did hire left his service as on Saturday the 17th of August and 16th of October in the same year, he puts out another advert in the Scotsman advertising the very same job. On Saturday the 12th of May 1917 Jackson Russell and his wife treated wounded soldiers to a day out at Udston House. Along with the staff of Greenfield School in Burnbank, they entertained the patients of Caldergrove Auxiliary Hospital for the afternoon in the lovely gardens and grounds of Udston House. The men, numbering the full complement of 30 patients, and accompanied by Nurses Cassels and Dalziel, travelled by car to Greenfield Station, where they were met by the staff. The more severely wounded men were, by the kindness of Mrs Russell, conveyed the grounds by motor. On arrival at Udston House, the men were supplied with ices, cigarettes, etc. After a tour around the spacious grounds, croquet and clock golf were played in the roundel, and the men thoroughly enjoyed themselves. At 4.50, high tea was served, to which all did ample justice and a happy hour was spent in fortune telling and cup reading. During tea, the company was visited by Mr and Mrs Jackson Russell, Mr Wm. Russell, London; Major. Mrs, and Miss Anderson; and the Rev. A. S. Dingwall Scott. On the call, Mr Ballantyne, a cordial measure of thanks was accorded Mr and Mrs Russell for their kindness in granting the use of the grounds and garage and for the many other evidences of their thoughtfulness for the comfort of all concerned. Mr Russell, in reply, assured the men and the staff that they were delighted to have them there that day, and trusted they were thoroughly enjoying” themselves. After further time spent in games, the men left for home at seven o’clock, the motor again being brought into service to convoy the men directly to the hospital. Before parting, the corporal in charged called upon the men to give a hearty vote of thanks to Ballantyne and his staff for their unique- entertainment. The weather was ideal, and this added greatly to the success of a happy gathering. Like the previous owners of Udston House, Jackson Russell did his part for the local community, he was also a member of the Burnbank Burns Club and during my research of him, I found numerous reports of his involvement in the club printed in newspapers. The name of Russell lives on in Burnbank, today it is better associated with Russell Street which is situated just off Udston Road. It is of no coincidence that the street is called this, as it takes its name from the Russell Family. On the 18th May 1918, there is an advert in the Hamilton Advertiser looking for a Garden Labourer. The job offered a House, coal and light. The application had to apply to McCaskie who was the head gardener. There was also one other resident who lived at Udston House for a brief short spell. The Pioneer of construction, ‘Sir Robert McAlpine’ who was responsible for building a good proportion of Burnbank’s concrete buildings lived here. I have to also note that he also lived in a house at Windsor Terrace and a property at Beckford Street which he built himself. Jackson Russell was the last private owner of Udston House and by the 1920s the coal which funded his wealth was starting to become exhausted. The local coal pits which were dotted around Hamilton were starting to close and as a result, people couldn’t afford to pay for the upkeep of these grand houses. This was not to say that Jackson Russell was a poor man as he had inherited a vast wealth from his father, perhaps Jackson Russell sold Udston House because large houses were going out of fashion. Owning a country mansion such as Udston House required a lot of staff to maintain it. You had to employ, Kitchen staff, Maids, Cooks, Gardner’s, Gamekeepers and a whole lot of other domestic servants and this required the owner to have enough funds to pay for this kind of lifestyle. Most of the old country mansions fell into disrepair and they became inhabitable and were condemned, but Udston had a new purpose, it would be bought by the Hamilton Burgh and this would secure its future and prevent it from having the same fate as most of the other mansions that were situated all around Burnbank. Just like Lewis Potter, Jackson Russell moved to the East of Scotland, but further afield than Edinburgh. Jackson and his wife bought the much larger and grander Archerfield House in Dirleton. Archerfield House was later also owned by Lord Belhaven and latterly the Duke of Hamilton and today it is used as a luxury retreat. Jackson Russell and his wife continued to live at Archerfield and did good work for charity, but tragedy struck when Mrs Russell was tragically killed in 1933 when her car overturned into a lake. Jackson Russell died at Archerfield House on the eighteenth of September 1936. At this time, I do not know if the Russell family continue to thrive in business as they did throughout their coal mining days. 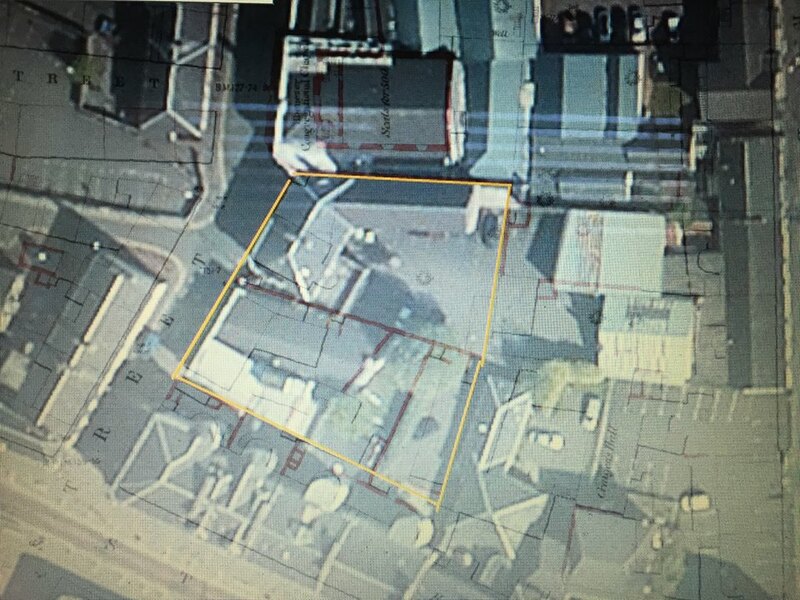 “That the Council invite the Local Government Board to inspect Udston House with a view to its being immediately occupied as an infectious diseases hospital, which would include alterations as can be at once effected. The motion, after some little discussion, was adopted and the Council afterwards met in committee to discuss its future. This was approved in December 1918 and the town council went ahead to put the plan into action. The gratifying announcement was made at the monthly meeting of Hamilton Town Council Tuesday the 10th of December 1918, that Udston House had been formally sanctioned by the Local Government Board as an infectious diseases hospital for the burgh. 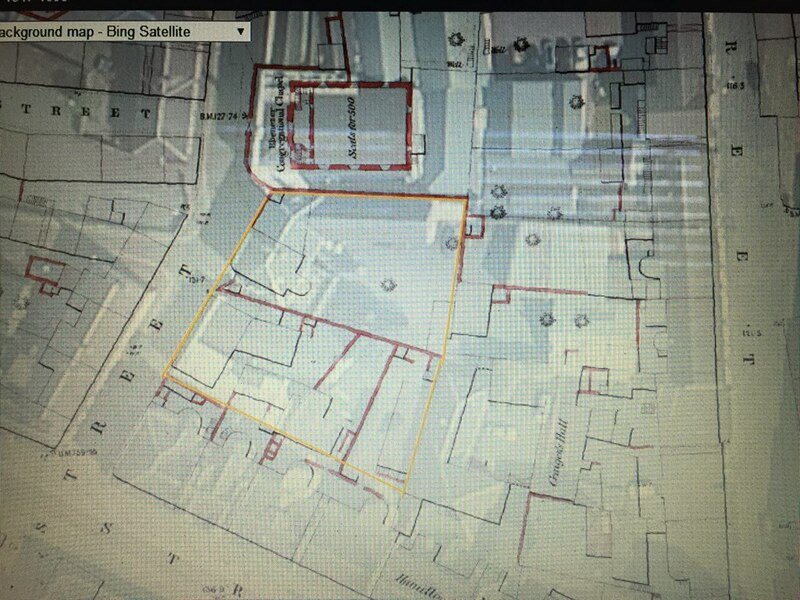 Judge Gunn, who was the convener of the Hospital Committee had made the announcement and said the present hospital in Beckford Street would be transferred to Udston on an early date and the buildings in Beckford Street would then become available for child welfare and maternity hospital purposes. In May 1919 the building at Beckford Street was vacated and the patients were moved to Udston. In 1920 the neighbouring Glenlee House was opened for a pulmonary TB Hospital with a joint Matron for both Hospitals. In 1930 a new single storey ward pavilion, operating theatre and laundry were built at Udston, the house was now a fully functioning hospital. Alterations were made at Udston in 1928 where extensions were added which included a new single storey ward pavilion, operating theatre and Laundry were built. On Friday the 19th of August 1932 a local councillor by the name of John Walker who resided at Alness Street died at Udston Hospital. The councillor was in the best of health; however, he had got a cut on his head and as a result septic poisoning developed and he was admitted to Udston where he died. Councillor Walker was a member of the Hamilton parish council as an independent. He was an elder of the St. John’s U.F. Church. His time was mainly devoted to Temperance work and he was appointed chief ranger of the Rechabite order in Scotland. One of his sons was the Rev John Walker who was sent for missionary work and at the time of his father’s death, he was in China. On Thursday the 21st of February 1935 a woman was arrested at Motherwell on the charge of abducting a seriously ill patient from Udston Hospital. It is unknown exactly what happened, but I assume that the sick patient was returned safely to the hospital. In the year 1935, the Matron of Udston Hospital was a lady from Larbert who was called Catherine Sinclair. The house was indeed a working hospital, however, its large grounds still needed to be maintained, so the gardener was kept on at Udston House and in 1930 another wedding takes place on the grounds of Udston. The head Gardner who at the time was called Alexander McCaskie had a daughter who gets married to a man named Robert Crombie. The address given was Udston House Gardens. This was to be the last wedding to take place at Udston House. In the summer of 1935, there was an outbreak of Enterek Fever across Glasgow and one case was reported at Udston Hospital and on Wednesday the 26th of February 1936 the Rev Father John McKenna who was the curate at St. Cuthbert’s Roman Catholic church in Burnbank died at Udston. He was 36 years old and he had contracted a chill, which developed to Pneumonia. There was an additional ward built in 1935 to house 20 extra beds, this was possibly to accommodate the outbreak of Enterek fever. In 1935, the Hamilton burgh were building a lot of new houses to keep up with the demand of people who had moved to the area. The new housing programme would have been started as the collieries begun to close and the tied house which came with the coal miner’s jobs were vacated. The lands at Udston were being transformed and the council were building houses close to the boundary of the garden of Udston House. The Udston housing estate today is known as ‘The Jungle’. In July 1935 a tragic accident occurred when a workman named John Hodge was digging a trench which he fell into and died. He was 59 years old and had been living at 187 Low Waters Road. In the 1930’s, Udston Hospital would have been avoided by everyone for the fear of catching something from the very sick patients who were unfortunate enough to be admitted to the hospital. Penicillin was first discovered by Alexander Fleming in 1929, however, it was not used as an antibiotic until the early 1940’s. When Penicillin was finally used for the treatment of what we now consider to be a ‘Minor’ infection, people would soon be treated at home and therefore freeing up spaces at hospitals such as Udston. In 1937 the matron put out an advertisement in the Scotsman looking to employ a new Sister. The advert asked for a specific person aged between 30-38 who was general & fever certified. The salary was set at £85 per annum. As the area around Udston and Hamilton grew, so did the requirement for additional space and more beds at Udston. In April 1938 Hamilton town council held a meeting to review the hospital accommodation and a proposal was put forward that an additional division with 30 more beds would be erected at the old Mansion House. In April 1938 after the announcement of the new wing of the hospital another staff nurse was needed, so another advert appears in the Scotsman looking to employee a new Staff Nurse to work in the tuberculosis wing at Udston and again in April 1939, the same advert appears. The day-to-day running’s of Udston hospital between 1939 and 1951 are quiet, and various adverts appear in local & national newspapers advertising different job positions. The days of having a job for life are disappearing and people are starting to move between jobs. There are also numerous obituaries reported in local newspapers of deaths at Udston and a lot of these are of elderly people and as antibiotics are saving more lives, younger people are overcoming diseases such as pneumonia, septic infections and other similar things. The alterations at Udston were ongoing and on the 8th of June 1951, the board of management invited tenders to form a new hospital unit with Nurses quarters. They were looking for Carpenters, bricklayers, electricians, plumbers, plasterers & painters to put in their offers and it was also stated that the lowest offer may not be accepted, so not only was the hospital looking for the best price, it was also needing to have the best quality. Udston was now becoming more of a working hospital with fewer admissions for serious infectious diseases. The patients are being admitted and are spending more time recovering from their illnesses and in December 1951 they were treated to a concert hosted by the D.L. Entertainers, who played music with their electric guitars. This would have been unheard of twenty years earlier as patients were admitted and most never came back out. The D.L. Entertainers also made a return to Udston in February 1953. In December 1953 Thirteen branches of the Rangers F.C. supporters association supported a charity event to raise money to buy TV sets for hospitals and Udston was one of the hospitals to receive one of these TVs. Udston would now have its very own TV room for the patients to sit and relax, the hospital was indeed moving ahead with the times. In 1951 Udston House was nearing its centenary and was in need of repairs so on the 8th of June in the same year a public notice was put out in all the major newspapers looking to for workmen to give them their quotes. Excavator, Bricks etc, Carpenter, Joiner, Glazer, Plumber, Plasterer, Electricians and painters. The contractors who wished to be placed on the list. Udston Hospital was used as a Tuberculosis Hospital as late as 1976 and as the bacterial diseases of the past were treated and controlled with antibiotics there was no longer any need to have a TB hospital. The hospital was eventually transformed to a retirement home where it continued to operate under South Lanarkshire Council. It was used as an old folks home as late as the 1990s and the section of Udston hospital and the former Udston House is today now used as offices for the NHS workers. I believe that that the old day wards of the Udston Hospital is now used for district nurses. When I was growing up and before my teenage years me and my old pals used to play on the grounds of Udston Hospital. There was a large grassy area and a grass football pitch behind the house and at the centre, there was a big tree and we had a rope swing on it. This was our playground and we would play here all day or run through Udston Woods. This was until the end of the 1980s when the council came in with their big diggers and chainsaws and they removed the open land and part of Udston Woods next to the bowling green. Our playground was taken from us and they built the new extension to Udston Hospital. For the next few years, we would play on the building site and what an adventure this was. We would play army and run about the new hospital and climb the roof. 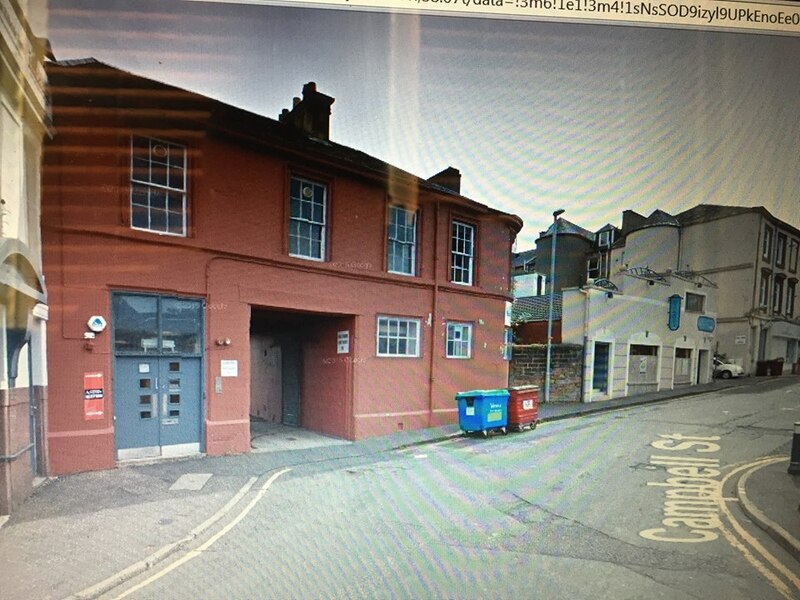 We then discovered that there was a secret tunnel that leads from the old extension beneath Udston house and it leads down to the old building which had the big red chimney, this just added to our adventure. In my opinion, the best thing that happened to Udston House was the fact that it was owned by South Lanarkshire Council and run by the NHS and this is the reason as to why the house still stands to this day. Udston House is one of the survivors which links us to our Past and when I was younger I used to take it for granted that this beautiful house was on my doorstep. I have found great pleasure in researching the house and I feel very proud to have told you the story of its owners. As it stands, it is uncertain what will become of the building, I would love nothing more than to see it brought back into private ownership and for it to be used once more as a grand family home, but as I write this story I have heard rumours that the hospital is to close. One other rumour is that the newer part of the hospital which was built in the 1980s is to be sold off and the land used to build new houses. This does not surprise me as there is already a large section of my childhood playground in Udston woods been removed behind John Ogilvy High School and new houses have been built here. Posted on June 17, 2018 June 17, 2018 Categories Burnbank, Garry L McCallum, Hamilto, Hamilton, Historic Hamilton, History, Uncategorized, www.historic-Hamilton.co.ukTags Annie McCall, Colnel Forrest, Earl of Kintore, Gavin Paterson, Jackson Russell, James Hamilton 1st Lord Hamilton, John Jack Forrest, Lady Georgina Belhaven, Lewis Potter, Louisa Keith Falconer, Madeline Louisa, Mains of Udston, Rev Robert Black, Sir John Watson, Udston, Udston House1 Comment on UDSTON HOUSE. WORLD WAR 2.1940, HAMILTON’S BLACK-OUT. A dissatisfied warden writes:- The last day of the “Passing Notes” in last Saturday’s ‘Advertiser’ concluded with patting Hamilton on the back because of its immunity from convictions for contraventions of the lighting restrictions. Anyone who is not blind will wonder why there have been no convictions. The only reason the writer can see is that there is a great deal of slackness on the part of those who should check or summon the offenders. Wardens and police, either or both, are failing in their duty, or else a score or two of offenders could be got every night. The test is: if it can be seen from the outside that there is a light inside, then the black out is not satisfactory. With this test in mind, let any person take a walk round the various districts in Hamilton and it will be seen that the existing conditions are disgraceful. People should come out and look at their own windows, back and front, after the black-out, and not be content with “oh, that’ll do.” Streaks of light from tops, edges and bottoms of windows can be seen almost everywhere. Another careless fault arises from doors left open with a hall light on. Again, some people, when seeing their visitors away at night, seem to think nothing of opening wide the front door with hall light full on, and lighting the path to the front gate to let their visitors see their way out. In a broadcast recently, a pilot said he flew for a considerable time over the district he was to visit but could not determine whether he was over the town or a wood near it. Suddenly he saw a pinpoint of light and that gave him his bearing. (That might have been someone showing visitors out.) Well, that was a British pilot looking for his target over Germany. The very same thing could happen here and the whole district be endangered be somebody’s carelessness. So far, nothing has happened here, but one never knows what night it might happen. The offenders in these lighting restrictions are not confined to one class. The writer has been all over Hamilton and has found lights in all classes of property, quite often in buildings and houses where a good example ought to be shown. Wake up, Hamiltonian’s! Get to it and make the black-out a black black-out. Ref. Hamilton Advertiser. 7/9/1940. Page 5. Posted on August 12, 2016 Categories Garry L McCallum, Hamilto, Hamilton, Historic Hamilton, UncategorizedTags Black out, Wilma Bolton, WW2, WW2 in HamiltonLeave a comment on WORLD WAR 2.1940, HAMILTON’S BLACK-OUT. Flyer for the Hamilton Coach works. 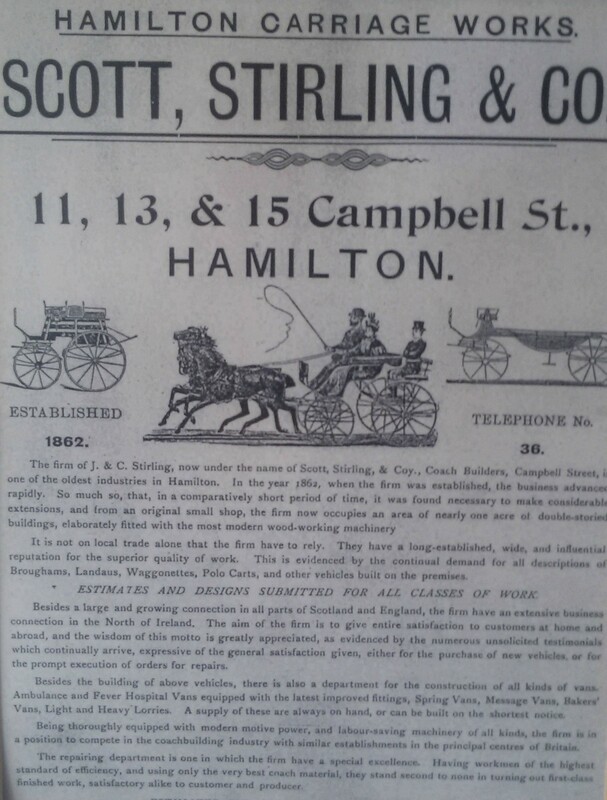 One of the major companies in Hamilton round about the turn of the 20th century was Scott, Stirling & Co! Scott, Stirling & Co were local coach builders in the town and they were founded in 1862 under the name J & C Stirling. They started off as a small business but quickly grew due to their excellent workmanship and at the time coach building was one of the oldest industries in Hamilton. In the year 1862 when the firm was established the business advanced rapidly. So mush so, that in a comparatively short period of time, it was found necessary to make considerable extensions, and from an original small shop, the firm now occupies an area of nearly one acre of double storied buildings, elaborately fitted with the most modern wood-working machinery. Scott, Stirling & Co were so reputable that not only did they build coaches and do repairs in Hamilton, they did work all over Scotland, England & Northern Ireland. They later built ambulance & fever hospital vans all equipped with the “latest improvised fittings”. They also built spring vans, message vans, bakers vans ans then moved on to light & heavy lorries. They were noted as stating ” A supply of these vans are always on hand, or can be built at the shortest notice” They could possibly have been the Quick Fit of it’s day in the late 1800s. Below is an advertisement for the carriage works that was gave to Historic Hamilton by Lesley Fife. 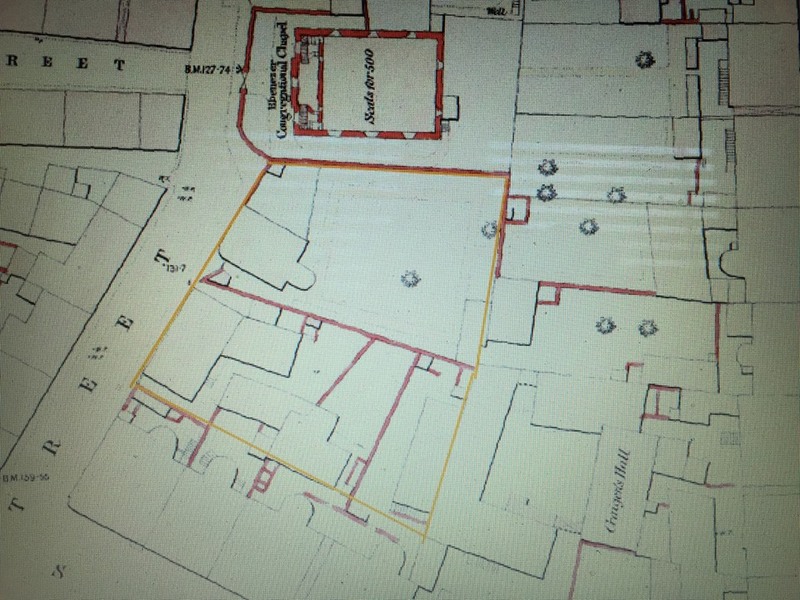 There is also a Yellow outline marking where the possible site of the coach works were situated just next to the Hamilton Advertiser building, this was taken from the 1847-1895 map of Hamilton.